Previous image, 50 total items. Next image, 50 total items. You've booked your plane ticket and packed your bags, but what do you know about your next exciting vacation destination? Sit back, relax and let us give you the inside information on Samana. This city is located about 60 miles (97 kilometers) to the northeast of Santo Domingo, the national capital, and 12 miles (19 kilometers) northeast of Sabana de la Mar. There are around 11,000 locals that live in this part of Dominican Republic. 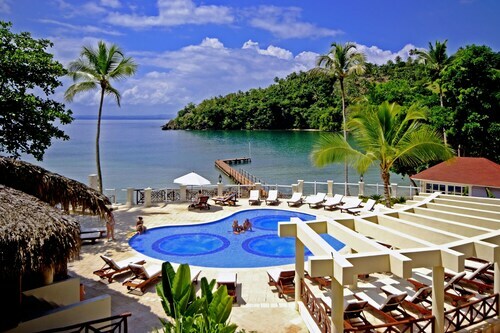 It's so simple to organize a trip to Samana with Travelocity. Ridiculous savings will be all yours when you book a flight and accommodation deal. And that's not all — you can select from at least 400 airlines and 665,000 listed accommodations. Our Customer 1st Guarantee gives you the added security of 24/7 personal assistance on everything from accommodations and airfares to activities and rental cars. If you somehow encounter an even better bargain on another site, we will refund the difference^. With no cancellation fees from us, you needn't worry about having to change your vacation plans. And as long as you get in quick, many accommodations won't charge a fee either^. When should you organize someplace to stay in Samana? The sooner the better! Get in quick in order to nab the best of the 7 properties available through Travelocity. After a jam-packed day of bouncing between Samana's attractions, there's nothing nicer than coming home to a comfortable room and a warm bed. 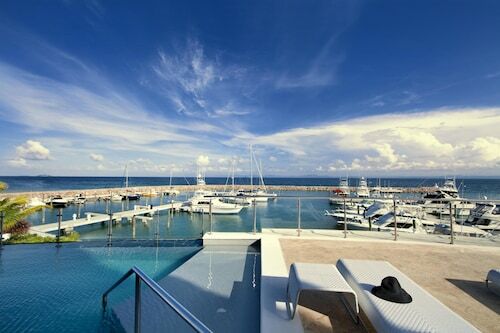 The Luxury Bahia Principe Cayo Levantado-All Inclusive/All Adult and The Bannister - Hotel & Yacht Club are a few of Travelocity's top accommodations. Where do you fly into for Samana? While you're organizing your Samana trip, keep in mind that the nearest major terminal, Las Americas International Airport (SDQ), is about 60 miles (97 kilometers) south of the main streets. Book your flights, pack your bags and get set for some exciting new adventures! Can I rent a car in Samana? Reserve a rental car with the help of Travelocity and experience Samana at your own pace. If you're arriving by air, you can easily collect a car from El Catey International Airport. Sixt is the place to look for. Our planet abounds with many surprising plants, creatures and discoveries. A trip to Whale Museum of Samana will illuminate the science of the natural world. Need some more ideas? History has infinite lessons. Drink in the knowledge and become more familiar with days gone by at Tainopark. But there's more. Water transportation forever changed the world and is still a crucial component of the world's economy. Head to Shipwreck Museum for an insightful look at maritime history. Overwhelming destinations, hospitable people and unique new experiences — that's what traveling is about. Getting excited about your next amazing adventure? While you're in Samana, why don't you go to some nearby localities? Santo Domingo, just 60 miles (97 kilometers) away, allows easy access to Alcazar de Colon, a much-loved attraction. If you have time to play with, check out National Palace too. You definitely won't be bored here! 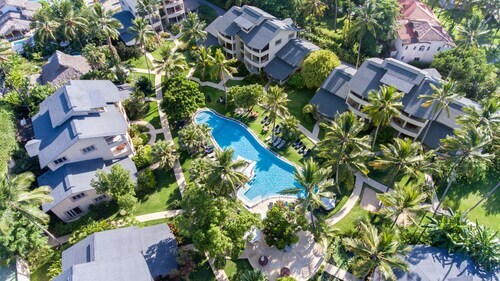 Located in Las Terrenas, this beachfront hotel is in the entertainment district and within a 10-minute walk of La Iglesia Beach and Beach Garden Plaza. Punta Popy Beach and Haitian Caraibes Art Gallery are also within 1 mi (2 km). The hotel is located in Cayo Levantado, a 1.5 kilometer tropical island, where nature bursts forth in its purest form; Hotel is 15 minutes ride from the town of Samaná and 45 from the nearest airport (Catey). Located on the waterfront, this family-friendly resort is within 9 mi (15 km) of Whale Museum of Samana, Samana Zipline, and Marine Life Experience Cayo Levantado. 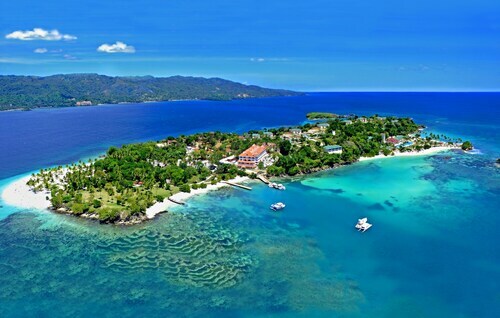 Cayo Levantado and Samana Bay are also within 9 mi (15 km). This charming hotel is located on the crystal blue waters of El Portillo beach, near the traditional village of Las Terrenas (4km). The Samana airport is 45 mins away and San Domingo City is 150 mins away. 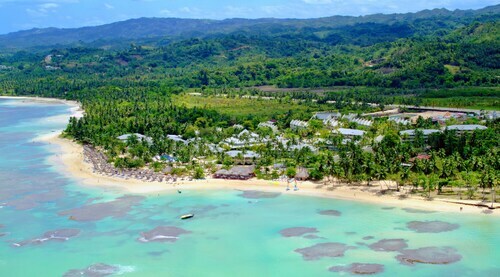 Nestled on the beach, this Las Terrenas hotel is 14.9 mi (24 km) from El Salto del Limon. 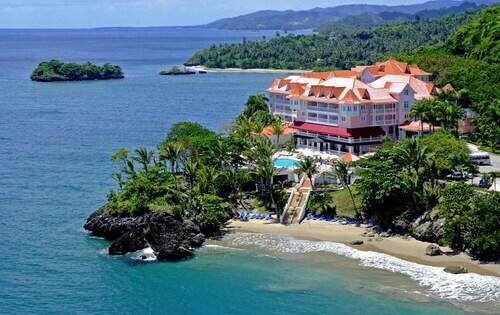 The hotel is located on the beach front near the charming town of Samana and 45km away from the airport. There the richness of the tropical nature and the quality of the white sand beaches are spectacular. Nestled on the beach, this Las Terrenas resort is within a 15-minute walk of La Iglesia Beach and Beach Garden Plaza. Haitian Caraibes Art Gallery and Plaza Rosada Shopping Center are also within 1 mi (2 km). Nestled on the beach, this Samana property is within a 5-minute walk of Cayo Levantado Beach and Cayo Levantado. Playa Las Flechas and Marine Life Experience Cayo Levantado are also within 15 minutes. *Savings based on all package bookings made with Flight + Hotel on Travelocity.com from January 1, 2018 to December 31, 2018, as compared to the price of the same components booked separately. Savings will vary based on origin/destination, length of trip, stay dates and selected travel supplier(s). Savings not available on all packages.